Green & White Winter Minestrone – Dig Delve – An online magazine about gardens, landscape, growing & making. 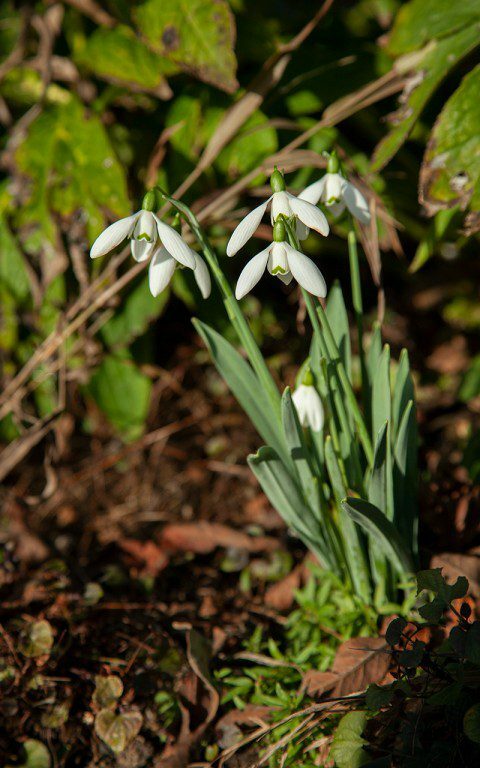 The snowdrops are just starting to hit their stride. Their new leaves and delicate white flowers pushing through bare soil have a freshness that is a welcome contrast to the prevailing mud and low light. It is also a time when, with straining post-festive season trousers, we tend to want to eat more freshly, craving simple greens and cleaner food as a balance to the richness common to many winter dishes. The colours of the winter vegetable garden are as vital as the snowdrops, primarily green and white; leeks and Swiss chard, celeriac, turnips and parsnips. We have a bed of salsify which, after you have scrubbed and peeled the gnarly, whiskery roots, reveal flesh of an unexpected pristine, pearly whiteness. In the barn are the last of the stored potatoes. Then there are the brassicas; cabbages Savoy and Hispi, three types of British kale, one of Russian, Cavolo Nero and purple sprouting broccolis just beginning to form. However, the cabbages have suffered this year from the long, hot summer, with many not hearting up, and so we have been eking them out or using them raw in salads so that they go a bit further. This recipe uses just one large leaf per person. Soups are the most regular feature of our winter eating – there is always one on the go – but they are most often made simply with one predominant vegetable. They are usually pretty fast affairs too, made on the hoof with quickly cooked onions, a limited number of flavourings and water straight from the tap. It can sometimes take half an hour or less to go from plot to soup bowl with a smooth, liquidised soup of carrot, pumpkin or parsnip. This week, however, I felt like taking some time to make something with a little more care, which preserved the delicacy of the vegetables and featured a well-flavoured vegetable broth made with the trimmings. 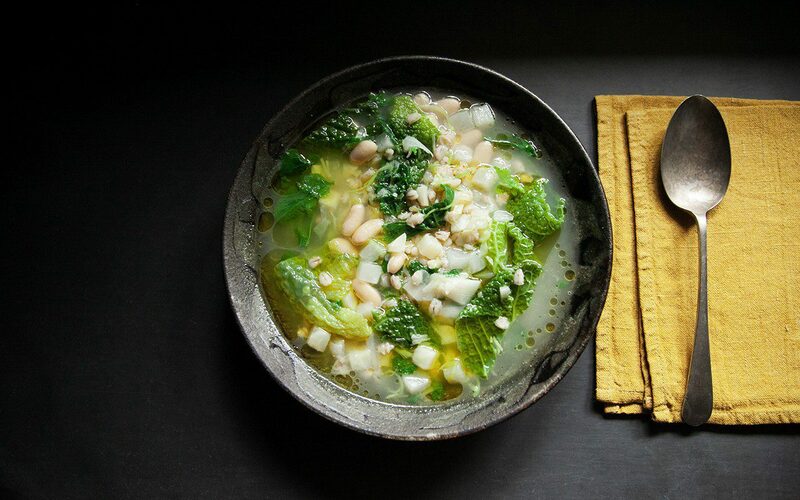 The addition of wholegrain hulled barley (rather than pasta or rice) and creamy cannellini beans makes for a particularly nutritious and filling soup. Barley has the added benefits of being rich in trace minerals and fibre, and has long been used medicinally to aid liver function and weight loss. Pearl barley can be used in its place, but is not a wholegrain, so lacking the benefits that they bring. Although you could add any winter veg to this soup, the limited colour palette of green and white is refreshing and clean. Just looking at it makes you feel as though it is going to be good for you. If you have fennel, cauliflower, white beetroot or parsnip available, these could all be added to or replace any of the ingredients listed in the appropriate proportions. Although it is still a little early in the season, this soup is the perfect vehicle for a mix of foraged herbs and greens. So, if you are making this in a few weeks time, you could add wild chervil, wild sorrel, wild garlic, dandelion leaves, Alexanders or nettle tops to increase its somewhat virtuous, health-giving (and waistline-reducing) properties. Start by making the stock. 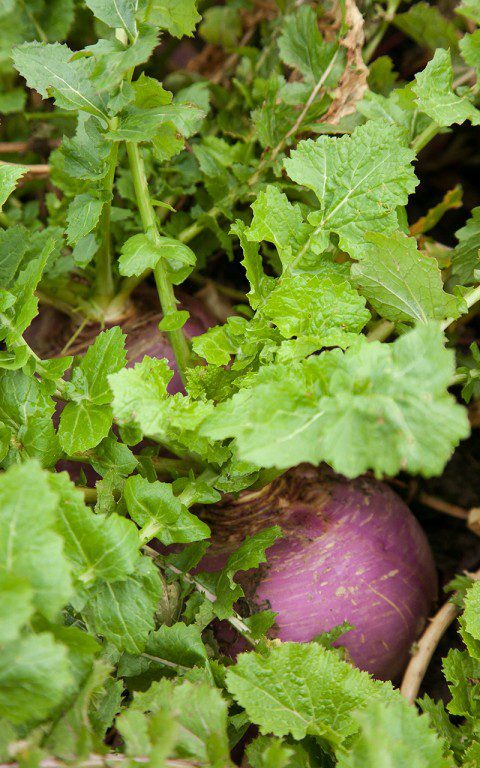 Scrub the turnip and celeriac well to remove all soil. Remove the leaves, then peel. Rub the celeriac all over with one half of the juiced lemon to prevent browning. Reserve the best, young turnip leaves and the tender young central leaves of the celeriac, if it still has them. Put the peelings and the older leaves into a pan with the water. Remove any browning leaves from the leeks, then cut off the dark green tops and wash off any soil under a cold running tap before adding them to the stock pan. Wash the cabbage leaves thoroughly. Remove the thick midribs with a sharp knife and put them into the pan. Tear the cabbage leaves into pieces about 4cm square and reserve. Remove the leaves from the parsley and reserve. Add the stalks to the stock pan. Add the bayleaf, thyme, rosemary, Parmesan rind (if used) and half a teaspoon of the whole green peppercorns, coarsely crushed. Use a sharp knife or vegetable peeler to pare a 6cm long piece of lemon zest, being careful not to include any pith, and add this to the pan. Put the pan on a high heat with a lid on and bring to the boil. Reduce the heat to a gentle simmer and cook for about 30 minutes. Strain the stock through a sieve, discard the vegetables, herbs and Parmesan rind and return the stock to the pan with the barley. Bring back to a gentle simmer, removing any scum that forms with a slotted spoon. Cook on a low heat with the lid on for 40 to 50 minutes until the barley is soft, but still has some bite. While the stock and barley are cooking prepare the vegetables. Put the juice of half the lemon into a bowl with 500ml cold water. 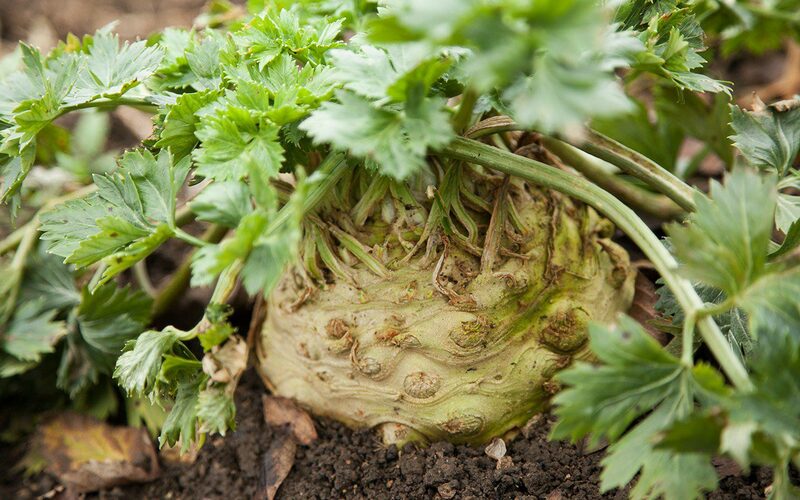 Cut the celeriac into 1cm square dice and put immediately into the acidulated water, to prevent browning. Cut the turnip into similar sized dice. Cut the white parts of the leeks on the diagonal into slices about 1cm thick. Reserve the pale green leek tops. Peel and finely chop the garlic. Warm 2 tablespoons of olive oil in a large pan over a low heat. Add the garlic and white parts of the leeks. Stir to coat in the oil, then put the lid on the pan and allow to sweat for about 10 minutes until soft and translucent. Stir from time to time. They should not take on any colour. Drain the celeriac and add to the leeks together with the turnip. Stir. Replace the lid and continue to sweat over a very low heat for about 20 minutes until almost cooked, stirring from time to time. Add the barley and cooking stock to the pan of vegetables together with the cannellini beans and return to a low heat. Season the soup with plenty of salt and the remaining green peppercorns, finely ground. Slice the pale green tops of the leeks very finely. Coarsely chop the reserved celeriac leaves and parsley. When the soup has returned to a simmer add the cabbage. Cook for 2 to 3 minutes with the pan covered. 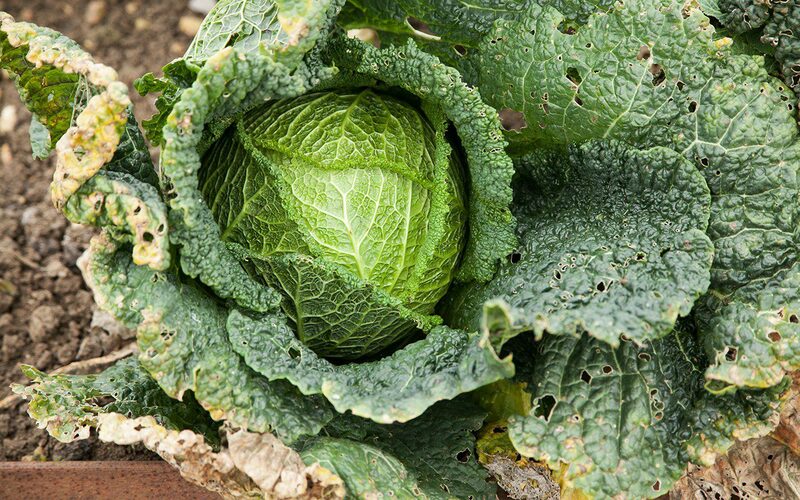 Remove from the heat while the cabbage leaves are still bright green. Throw in the finely sliced leek tops, turnip and celeriac leaves and parsley and stir well. Check the seasoning and add lemon juice to brighten the flavours. Ladle into warmed bowls and finish with a good amount of your best olive oil.